Always an adventure in our little world! Today, my friend and I ventured to the Milwaukee-area to the 2012 Great Lakes Multisport Expo (HERE). I had attended the expo the past two years (once in the State Fair Park grounds and the other at it's current location in Franklin). My friend and I had a tough time finding the expo location, just like I did last year. When we got to the expo around lunchtime, the parking lot looked pretty much cleared out. Once we got inside and paid for the $10 wristbands, the expo was pretty dead. He and I were kind of puzzled by how we were goin to make our $10 admission worth or money, time and effort. There weren't many people wandering the aisles and the exhibitors looked bored (texting and chit-chatting). Still, it was nice to be surrounded by like-minded people and go on a little road trip during the Wisconsin winter. I'm glad we went, despite the lack of booths, shopping and empty walkways. They even closed up early!! 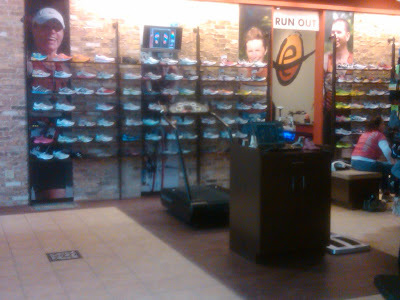 We did end up visiting the Revolution Running and Walking Center (HERE) booth twice. Kyle is a certified pedorthist and new a ton about natural and barefoot running. We could have talked to him forever ... and he eventually convinced us to try on some Vibrams. I was shocked by how comfortable they were to walk and run in. I may need to pick up a pair sometime soon, just like my buddy did. 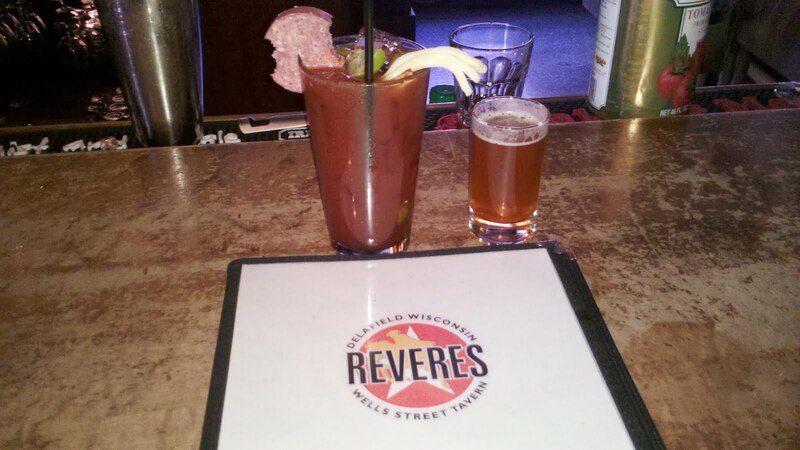 I will definitely be stopping by to visit Kyle and Rovolution's store next time I'm in the Wauwatosa area. He was extremely knowledgeable and made me think about my stride, my posture and got me excited about making some changes. There were a lot of race exhibitors, most were races I've already done in the past or am currently signed up for. 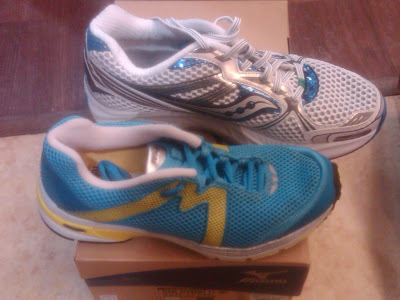 But we did find out about a new 5K series in the Madison area, which I'm excited to take part in this year. There were absolutely no booths geared towards female runners. From attending other expos (large or small), I see how those women storm booths for female running apparel and sort through bins and bins of Bondi Bands. Nothing! We chicks like to shop ... they definitely need to expand their list of exhibitors next year. Or I worry the event will be cancelled entirely. The expo got my juices flowing and my brainstorming sessions started as soon as we got back in the car. I am so excited to see what 2012 is going to bring my way ... or should I say, what I'm going to make happen! Even though the expo was sparse and I didn't purchase a single thing ... I'm glad that we went, because I got exactly what I wanted from it ... to network and get some ideas going on what I can do with RDM and for my clients in the future. After the expo, we detoured off the interstate to Cafe Hollander in Wauwatosa (HERE). The cute little community was an adorable cycling and running-friendly community. I loved it. This theme continued inside of the restaurant. We sat in a spot next to the river and had a nice view. We were surrounded by signs, posters and paintings of cyclists and people being active. It was a perfect fit for us and our lifestyle. I indulged in an avocado chicken wrap and some delicious sweet potato fries -- yum! I can't wait to try out their other locations next time I'm in the area. On the way in the door we saw this advertisement for Diva Night and had a great chuckle. On the way out, I must've made quite the impression with a guy at the bar because he said they'd see me back for Diva Night ... so I posed for a cheesy picture; what I do best. I recently wrote about embracing my healthy lifestyle in a post and shopping for it (HERE). There were 32 entries in my recent giveaway on the RDM blog and Facebook page. One winner was chose at random to receive these Peace-Love-Fitness notepads. I was recently given the opportunity to review Nutrition Bars from PureFit. You can read all about my fabulous experience HERE. Please visit PureFit Nutrition Bars online HERE and start shopping. There were 33 entries in my recent giveaway on the RDM blog and Facebook page. One winner was chose at random to receive PureFit Nutrition Bars. I was recently given the opportunity to review a running skirt from Running Chics. You can read all about my fabulous experience HERE. Please visit Running Chics online HERE and start shopping. There were 187 entries in my recent giveaway on the RDM blog and Facebook page. One winner was chose at random to receive a Running Chics Running Skirt. with the "30 goals challenge"
While doing my usual weekly search for motivational quotes and sayings online, I came across a fabulous company, called Think Happy Stuff (HERE). Everything on their site spoke to me ... through times of sadness and discouragement ... a few words ... or happy thoughts from friends and family have really made a difference in my life over the past year. I try to think happy thoughts as often as I can. That is why I started posting morning quotes over on the Running Diva Mom Facebook Page (HERE) every day. It gets your day started off right. Think Happy Stuff Founder Christine Fekete and her children live in Franklin, TN. Four are birth children- four are adopted.Three are adopted through the State of Tennessee. One son is from China, and joined us when he was nine.I am continuously amazed by my children. Their young hearts are healing from horrible injustices. If anyone had the right to be mad at the world, it would be them. However, I have seen these children learn how to love and trust again. It is astounding.I have seen our birth children bond and accept their new siblings without hesitation. When others at their schools did not believe that a white boy, a bi-racial boy and a Chinese boy could all be brothers, it never occurred to my birth son to end the argument my simply stating that his brothers were "adopted". He just knows them as his brothers. I love that. It insipres me.Part of my journey includes a battle with depression. This was a battle long before I had children. To the world, I seemed happy, confident and secure. I thought I was "OK", but then I would "crash out"- sometimes even desiring to permanently "check out". Then I'd get over it and move on- until I crashed again. It was a continuous, exhausting cycle. I sought the help I needed. And I began to realize there are no small choices- everything is connected.How I choose to respond to the smaller challenges life brings determines how I respond to the bigger challenges life brings. Even the mug I choose for my morning tea in can encourage me and help get me in the right minset for the day ahead. I know that no matter how deep and painful my experience, God's grace ALWAYS runs deeper. I do not completely understand the law of gravity, but from personal experience, I know it to be true. I do not completely understand this law of Grace, but from personal experience, I know it to be true. Therefore, I can think happy stuff. When think happy stuff, inc. began in December 2006 I began to more freely share my story- and in return, I had the honor of hearing other people's stories. "I was just diagnosed with cancer. I need this mug." "We were told our son would not live past the age of two. Now he is ten. I am getting him this shirt!" "My sister died of cancer. Her family needs these shirts." "My husband was just deployed to Iraq for the third time. I need to surround myself with this stuff." "My friend just had a double mastectomy...." "I struggle with depression..." "My husband just left me..." "I'm in recovery..."There is such power when we share our stories with each other! Change your thinking. Change your world. Think happy stuff. I received the Change Your Thinking Gift Book (HERE). It retails for $12 and is a great gift for anyone ... whether they are currently going through struggles, or you just want to make their day. The book makes a great stocking stuffer or a special "just because" gift for someone you care about. "This book is a simple, yet profound reminder that we have a choice about how we face the challenges life brings. We can let the challenges wear us down, or we can face them head on. How you think not only impacts you, but the world around you." This book is filled with fabulous ideas to make you change your outlook on situations and on life. It touches on everything from performing random acts of kindnes ... to taking time for yourself ... to being punctual ... to giving a good ol' hug. Take time opening the book to a random page and stop and think about how one small change in your daily routine can change your whole day ... or the day of someone else. It will surely change your perspective and separate the negative from the positive. I choose to be positive!! I did not have this book when I was going through my divorce last year and wish I had. Instead I turned to other blogs or motivational quotes online. This page-turner is a good reminder that positive things happen to positive people!! I also couldn't think of a better start your day than with a good ol' cup of coffee (with lots of flavored creamer in it!!). This Think Happy Stuff Bistro Mug (HERE) is a great way to motivate you to start your day on a positive note. It reatails for $12 and is a good investment in your day. The bright and cheery colors will brighten your day in the easiest way possible; just choose your favorite color: in pink, yellow, light green, light blue and lavender. Enter now though Thursday, February 2. Winner will be announced on Friday, February 3. 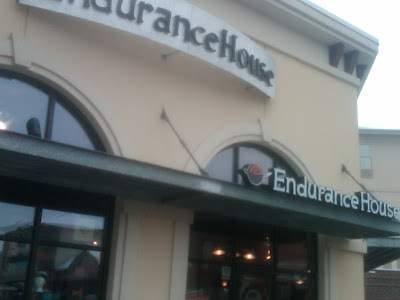 Every January, a local running store, Endurance House (HERE), hosts a huge sale. It's their Great Race Giveaway ... for every $150 you spend, you get free or discounted race entries. This is how I signed up for the Haunted Hustle Marathon last year. As of this afternoon, I am committed again this year ... just like that!!! That is the second of three full marathons I'm going to commit to this year ... yikes! There were a lot of people in the store this afternoon (the third day of the annual sale) ... many people were there to stock up on running shoes. People were being professionally fitted, running on the treadmill, watching their strids on the video, checkout lines were long, race registration forms ran out and were being copied, there wasn't enough staff on hand, they were running low on my size 10s in most stability shoes. But, the kids were entertained in the play area by the fire place and I was surrounded by beautiful running shoes and like-minded people ... so I was all good. Since they were out of my size in my usual Brooks Adrenalines, I tried on a few different brands and styles of stability shoes. I ended up with two pairs that were quite comfy and not too bad to look at either. A bag full of running shoes, the day after a fantastic indoor half marathon ... in the middle of winter in Wisconsin. Anything to keep you motivated through the wind, freezing temperatures and snow, right?!?!!? On Saturday, I was scheduled to run the Icebreaker Indoor Half Marathon (HERE). It's just about the only place you can run an organized half marathon in Wisconsin in the Winter. Sign me up! I was scheduled to run the race last year, but had to DNS due to a death in the family. I was able to spectate the full marathon on Sunday. You can read about my 2011 spectator report (HERE). I was very excited to race the event this year ... and visit a few friends of RDM while I was there. The weekend of events included a 5K on Friday evening, two half marathons on Saturday (at 7:00 AM and 9:30 AM - each limited to 130 slots) and a full marathon on Sunday (also limited to 130 slots). There was also a marathon relay and the Gold Medal Challenge (for runners that participated in both the half and the full marathon -- limted to 40 slots). The half marathon consisted of approximately 48 laps arround the Pettit Ice Center in Milwauke, Wisconsin (HERE). The earlier race had a two hour cut-off. Since I typically run a 1:56-1:58, I wasn't sure which race to do ... but, opted to run the earlier race, with the more competitive runners. I just was hoping that I didn't finish last. 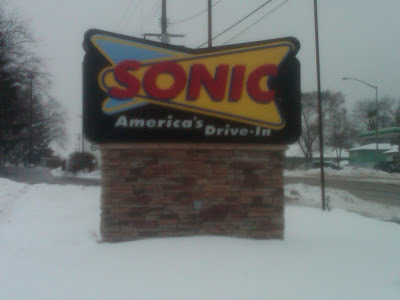 I drove up Friday evening in a snow storm and stayed in the Brookfield area. I ended up doing packet pick-up on race morning, due to the weather on Friday. Race morning, I woke up at 5:30 AM, ate a 0% Chobani, a banana and a Clif Bar. I downed some water and Powerade Zero while heading to the Pettit Center to pick up my packet. While in the pick-up area, I met up with my blogger friend, Amy, from Running is Cheaper than Therapy (HERE). The room overlooked the ice arena and was filled with runners sitting at tables, doing last minute adjustments and making rest stops. The restroom wasn't busy at all, and I think we all can appreciate that! There were also two port-o-potties on the either side of the track to use pre-race. We headed down to the track to cooler temps and got situated, put our stuff down, placed our labeled bottles on the water bottle tables, I downed another banana and sipped on some Gu, and then we headed to the startline for the National Anthem (played on saxophone). We also met up with our blogger buddy, Bill @ Love 2 Run (HERE) pre-race, who is on the race committee and has been giving us lots of helpful advice about the race over the past year. At the startline, they did a count down to the start .... missed it .... and restarted. After a few chuckles and another countdown ... we were off!! The first couple of laps were crowded. Slower runners were instructed to stay on the outside and faster runners would pass on the inside. Being in the earlier, faster race, there were a TON of competitive runners. I'm not use to running with that group and it was fascinating to watch them use everything they had in their tank. It was also quite deflating to get passed by nearly everyone and feel like you are left in the dust. I ran with Amy a few laps, until I just trailed behind and let her take off. She's typically faster than me and I didn't want to kill myself lap-after-lap-after-lap. I got in a groove, a rhythm, and enjoyed myself. I had a few people in various spots around the track that I new and I found it really helpful to have those distractions. I figured from the pace chart that Bill showed us, that each lap should take me about 2:10-2:20. Amy passed me just after 27 minutes and then I saw her once again after that. She was doing great. The chip was counting our laps and I watched the leader board at the finishline with every lap. The frustrating part was that it was showing runners that were on the other side of the track. So, I never was able to see my name. But, volunteers would call out your name and which lap you were on or how many you had left to go. The water bottle table was also quite helpful. You labeled your bottle with your bib number ... would instruct the volunteers that you wanted your bottle on your next lap ... and there it was waiting for you ... then you would drop it off at the refill table or with a volunteer ... and it would be ready for you the next time you needed it. Sweet, right?!?!? I carried my bottle with me for much of the second half of the race. I also stuck two Gu packets in it and used both of them. Vanilla Gu was also provided at the water table about halfway through the race ... but I opted not to take it. I wore a long sleeve technical top, a running skirt and some CEP Compression socks. It was quite comfortable in the cooler temperatures. I had run 130 laps around a smaller track recently to complete and improptu half marathon of my own ... so mentally, the 48 laps weren't too tough on me mentally. I enjoyed the cushioned tracks, the flat course, and the controlled temperature. Speed skaters were practicing, a hockey game was going on, and figure skaters were practicing as well. I watched the dude on the zamboni and watched spectators cheer with every lap. Bill was really good about telling me how many laps I had left throughout the last part of the race. With five laps left, I tried to kick it into gear a bit ... and the last two laps I really tried to kick it up a notch. I had heard Amy's name announced as she finished and she was at the finish line cheering me on. And there were quite a few runners left on the track when I crossed that finish line ... I did not finish last. I ended up finishing around 1:54 and some change. I walked to the "finish line", was handed a bottle of water, my medal and enjoyed the moment. We chatted a bit and then headed to the room with post-race refreshments ... there were a lot of sweets! We ended up picking up some handmade running shoe cutout cookies and some refueled with chocolate milk. With every race I do, I love to experience the local community and see what it has to offer ... including a local cupcakery! I was able to find Miss Julia's Bake Shop in Brookfield (HERE). So, we stopped there after the race to eat a well-deserved cupcake and caffeinate with some delicious coffee. I opted for a coconut cupcake and also purchased a couple to take home to Little Dude and Little Diva. The cupcake shop was absolutely adorable ... the treats were yummy ... definitely a must-stop if you are in the area.